Time constraints which prevented a Super Over from separating Titans and Warriors after a tie in Centurion has left both teams on the brink of exiting the competition. The sides were awarded three points each, and with just three games left to play they will need bonus-point victories and a combination of other results to go their way, and may have been left to rue the playing conditions. Rain ate into a significant chunk of the time allotted for the game, which was due to start at noon but was delayed for two-and-a-half hours. When the match began at 2.30pm, it was reduced to eight overs a side. The eight-over match ended shortly before 4.00pm, well after the scheduled closing time of 3.10pm, which was why the super over could not take place. The regulations state that a super over will take place in the event of a tied game, 10 minutes after the conclusion of the match, provided there is enough time. "The amount of extra time allocated to the Super Over is the greater of (a) the extra time allocated to the original match less the amount of extra time actually utilised and (b) the gap between the actual end of the match and the time the original match would have been scheduled to finish had the whole of the extra time provision been utilised," according to a CSA release. "Should play be delayed prior to or during the Super Over, once the playing time lost exceeds the extra time allocated, the Super Over shall be abandoned." Titans batted first and Henry Davids got them off to a blistering start with 22 runs in boundaries inside the first two overs. He fell on his sword when he top-edged to end an ideal opening. None of the other Titans batsmen could match Davids' aggression, particularly against Rusty Theron, who gave away only 13 runs in two overs and Ayabulela Gqamane, who took two wickets in his only over. Despite the flurry of activity, the Titans ended on a competitive 79 for 5. JJ Smuts led the Warriors response with two boundaries off the first three balls he faced but Ethy Mbhalati, Junior Dala and David Wiese all took wickets in their opening overs to peg the Warriors back. At 24 for 3 after three overs, they needed big runs quickly and they came from Simon Harmer. The offspinner blasted 24 runs off 12 balls and Smuts continued plundering at the other end to leave Warriors needing just six of the final over. Wiese took a wicket with the first ball, Smuts was run out off the next one, and three more singles and a wide saw the match tied. The players were gearing up for a six-ball shootout only to be told they had fallen foul of the clock and would share the points instead. This is the second tie in South Africa's domestic twenty-over competition this summer. The match between Lions and Knights in Potchefstroom was tied after 20 overs. The super over was also tied and Lions won the game because of a better boundary count. Cape Cobras leapfrogged Lions into the top of the table after a convincing 77-run win at Newlands, where three-wicket hauls from George Linde and Dane Paterson sent Lions crashing to 77 all out. Chasing 154, Lions were bowled out with 27 balls still left to play, with no one apart from Neil McKenzie and Temba Bavuma getting into double figures. McKenzie and Bavuma put on 34 for the third wicket, but the end of the partnership precipitated a collapse that saw Lions lose their last eight wickets for just 22 runs. Having chosen to bat, Cobras lost an early wicket but partnerships of 45 between Richard Levi and Omphile Ramela for the second wicket and 54 between Ramela and Dane Vilas for the third set them up for an eventual score of 154, even though they lost wickets at a heap towards the end. 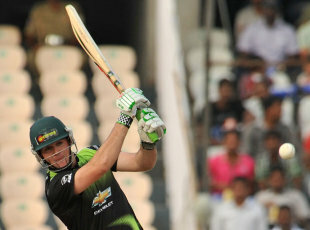 Vilas top-scored with a 29-ball 54, striking three fours and three sixes.